The LG Dare and Blackberry Storm are two of the most popular iphone clones available today. The main difference between the two is that the storm is a smart phone while the dare is not. This should be your main deciding criteria in choosing your phone. If you use your phone for business and emails are essential to you then your only option is the storm, but if you are just looking for a phone that looks and acts like the iphone then the dare would fit your bill. Blackberry has been known for years as a solid producer of business oriented mobile phones; the storm is no different from t he rest of their products. What differentiates the storm is the fact that it has traded the physical QWERTY keyboard that has been standard in most blackberry devices for a much bigger screen. 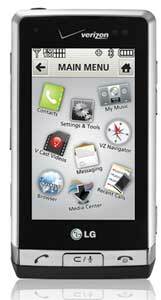 LG on the other hand has had a few attempts in building an iphone clone, namely the Voyage and the VU. The dare has been declared by a lot of critics as the best that has come from LG by far. To start the comparison, we look into these two phones most prominent feature, the screen. The size of the storm’s screen is slightly bigger than the dare’s by a quarter of an inch but the dare wins in quality with 262k colors over the storms measly 65k. Comparing the software that comes with the two would simply be a mismatch. Being a smart phone, the Storm comes complete with all the necessary applications like its ‘To Go’ suite of applications that allows users to open or edit Word, Excel, and Powerpoint files. Not to mention the corporate email capabilities of blackberry that has been unmatched by any other mobile phone in the market. In these areas, the Dare is totally left in the dust. A very notable advantage that the Dare has over the Storm though is its very advanced camera, despite having the same resolution at 3.2 megapixels. Features abound in the Dare camera; the list includes photometry options, color and light compensation, noise reduction, and even facial recognition. This makes the camera in the Dare superior even to cameras in other phones, much more so to the slightly inferior camera of the storm that takes a long time even to load. Ben Joan. "Difference Between LG Dare and BlackBerry Storm." DifferenceBetween.net. October 13, 2009 < http://www.differencebetween.net/object/difference-between-lg-dare-and-blackberry-storm/ >.